Chechen warlord Shamil Basayev has said he organised the Russian school siege in which at least 320 hostages were killed, many of them children. In a letter published by leading rebel websites, he said a suicide battalion had carried out the Beslan attack. The letter also claimed bomb attacks on two Russian airliners and a Moscow metro station this summer. 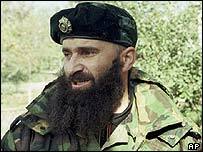 Russia is offering $10m for the capture of Mr Basayev, whose reported actions a US official described as "inhuman". "On the question of Basayev's statement taking credit for the massacre in Beslan, it is proved beyond the shadow of a doubt that this is inhuman," said US Deputy Secretary of State Richard Armitage on a visit to Poland. "Anyone who would use innocents for political aims is not worthy of existence." Aslan Maskhadov, the main Chechen rebel leader, has denied any links to the three-day siege in the North Ossetian town which ended in carnage. President Vladimir Putin warns that Russia is "seriously preparing to take preventive action against terrorists... in accordance with the norms of international law"
A regional amnesty commission pardons Colonel Yuri Budanov, a Russian army officer sentenced to 10 years in jail for murdering a young Chechen woman - but the pardon must still be approved by President Putin. The message from Mr Basayev was published on Friday by Chechen Press and Kavkaz Tsentr, the two main Chechen rebel websites. The BBC's Steve Rosenberg in Moscow says it is no surprise that there is a claim of responsibility from the warlord, now Russia's most wanted man. Mr Basayev said his Riyadus-Salikhin "martyr battalion" had carried out the Beslan raid and the other attacks. He identified the commander of the Beslan raid as a "Colonel Orstkhoyev" and said that 31 people from various ethnic groups in Russia were involved along with two "Arabs". The attackers included 12 Chechen men and two Chechen women, he said. Mr Basayev blamed President Putin for the deaths at the school, which he called a "terrible tragedy". He said they had been caused by Russian special forces storming the building on 3 September. Russia has always insisted its commandos assaulted the Beslan school only when explosives planted by the hostage-takers began to go off inside and children tried to run to safety. "In the most impudent manner Putin is now trying to blame us for that, accusing us also of international terrorism and appealing to the world for help," said Mr Basayev. Describing Mr Putin as a "bloodsucker", he accused him of wanting to "satisfy his imperial ambitions and to keep his job". "He wants to link the rest of the world to the blood spilled in Beslan... but forgets at the same time that 'Chechnya is Russia's internal affair'," he said. Mr Basayev said the hostage-takers had been demanding the withdrawal of Russian forces from Chechnya. Mr Putin announced sweeping security and political changes in the wake of the Beslan siege, sealing borders in the Caucasus region and revealing plans to return more power to the president. But Mr Putin was criticised by his predecessor as president, Boris Yeltsin, who said Russians should not allow their country to move away from democracy. "The stifling of freedoms... will mean... the terrorists will have won," Mr Yeltsin said in an interview published in the Moscow News. Our correspondent says it is the first significant comment from Mr Yeltsin since he handed power to Mr Putin five years ago. "The authorities have offered $10 million to anyone who can help track down Basayev"